Can you delete Facebook messages? I shall tell you that it is a common and easy-to-solve thing to delete Facebook messages on iOS devices (including iOS 11 devices). Just like deletion of any email message or media files like photo and videos on iPhone X or other devices, you just need several clicks. Now, no matter you want to delete all messages from Facebook messenger to gain more space or just wish to delete one useless conversation on Facebook, you can find corresponding solutions in this article. Also, many useful tips and tricks, warnings, and guidelines to better deleting messages from Facebook on iOS are provided here. The Facebook Messenger app for iOS devices lets you be in touch with friends, relatives, co-workers. But somehow you decided to erase a few of your messages. You should know that deleting a message does not remove the message from the recipient's inbox. Thus, the deletion of a message only removes your copy of the message from your inbox. And be careful as the deletion of one Facebook message is permanent and cannot be undone. Our days you are not able anymore to delete Facebook messages on iOS from the Facebook app or from the Facebook mobile site. Single way to erase Facebook messages from your iPhone it is by using the Facebook Messenger app. Well, for those messages you don't really want to delete, you can choose to archive Facebook messages if necessary. Usually you will find the FB Messenger icon on your first screen. Tap on it and your app it will be open. This program offers you 17 languages to choose from. You can click PDF Converter Pro > Preferences to open the Preferences window. Then hit the OCR tab and tick the language you prefer. Press and hold the message with your finger. After the menu will appear, just tap "Delete" in order to erase that message. The message will be removed from your message history. You need to be careful because one movement can delete a Facebook conversation. All you need to do it is to swipe a conversation from right to left and this action will delete the entire conversation. Scroll your list of conversations to find the specific one Facebook message you want to delete. Instead of opening the conversation, swipe the conversation from right to left. You will have the option to "Delete" or "Archive" the conversation. Tap the "Delete" button in order to erase that conversation. 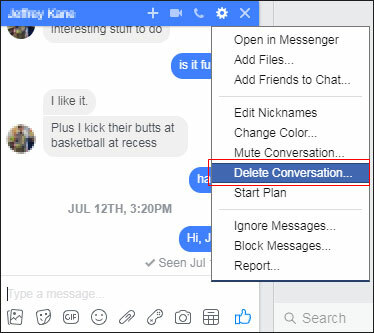 If you want to delete a Facebook conversation on computer, the following guide will tell you how to. Click the message inbox from the Facebook page, choose the conversation that you want to delete. Now at the top of the conversation window, click the Gear button and select "Delect Conversation". That's it! This will delete all messages in this conversation. Question: Does Deleting Facebook Messages Remove It From the Recipient's Messages Too? If you got a question like, if I delete Facebook messages from my Facebook, will the recipient know? or will the deleted messages removed from the recipient inbox? Well, don't worry. The answer is no. 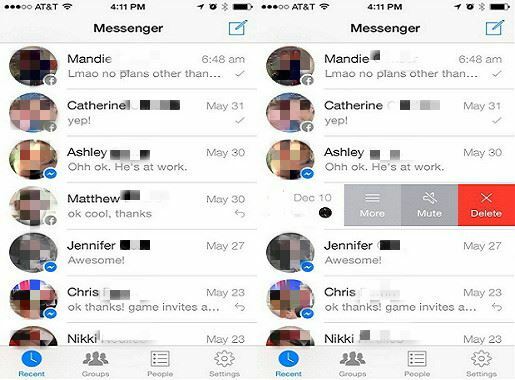 Deleing facebook messages will not delete the same messages from the recipients. 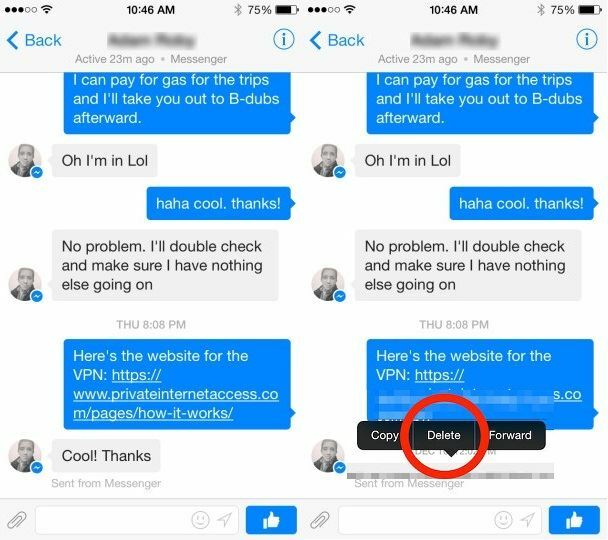 Here are some tips for avoid accidentally send messages on Facebook messenger. Privacy Setting. In the "Who Can See My Stuff?" section, you will view one option called "Who Can See My Posts?" and the possible answers are "Public", "Friends", and other options. Click on and select "Only Me" from this list with options. By choosing this option, your posts will be invisible to everyone else by default. Thus, for any post you can select the post sharing public just when you wish. Tip 2. The private messages you can delete them after sending but the recipient will still receive them. Thus you need to be careful when you send private messages. If you sent accidentally one message, maybe you wish to unsend it. There are several apps that can do the work for you like WeChat app for iOS that has a Message Recall feature. Tip 3. 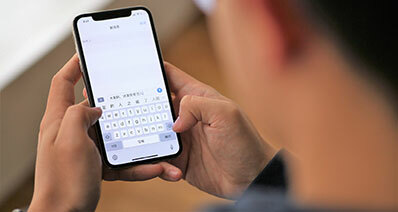 Maybe one desperate but easy way to stop immediately sending the message it is to turn on Airplane Mode in order to cut off any connections to that message. The latest versions of iOS offer quick toggles with the Control Center. Thus you can fast put a stop to the respective message. The message will be not sent and you have the option to delete it before turning Airplane Mode off. 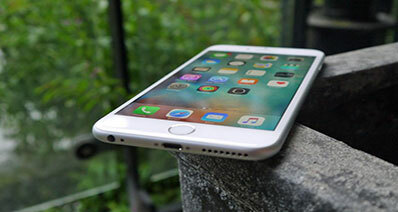 As we know the data can be still hide in our iphone by simply delete, and can be recovered. 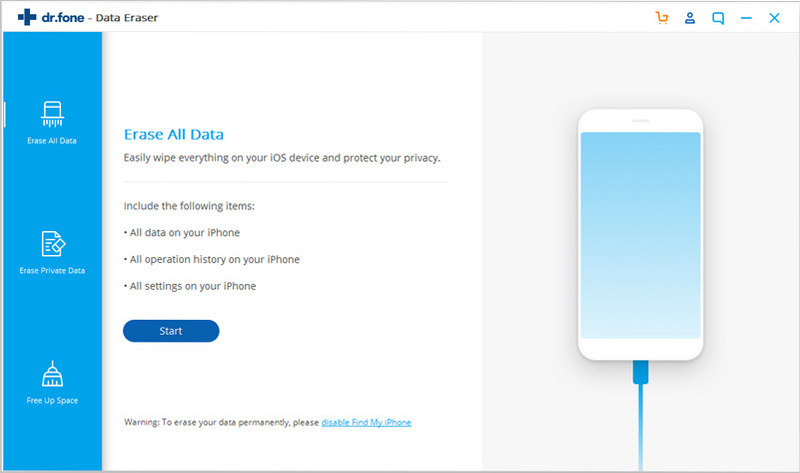 If you have some private data that you are worried about leaked out, like sensive photos, mesages, videos, etc, I would like to recommend you iSkysoft Toolbox - iOS Private Data Eraser to protect your privacy by permanently deletion. There is no software on the market couldever recover the data that deleted by iSkysoft Toolbox. iSkysoft Toolbox fully support iOS (including iOS 11) device including iPhone X, iPhone 8/8 Plus, iPhone 7/7 Plus, iPhone 6/6s/6 Plus, iPhone 5/5s/5c and the ealier versons. Also support iPad and iPod touch. 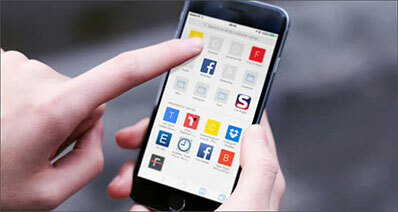 Here is the guide on How to Completely Delete Data on iPhone with iSkysoft Toolbox.